ESSAY: Inside and Outside: An Essay on Leslie Friedman's "Go Home"
What does it mean to feel at home? For home to be a place that doesn’t seem to particularly want you? For home to be transitory and impermanent? To be an outsider? I ponder these questions as I meet Leslie Friedman for the first time at Ray’s in Philadelphia’s Chinatown. I’m scanning the menu when she comes in, smiling and apologizing for being fifteen minutes late. Philadelphia traffic and parking, she says by way of apology. I’m slightly nervous and excited as she takes her seat across from me, the both of us packed into a tiny table by the coffee machine. After all, I am writing an essay for an artist whose work I admire, it’s our first-ever meeting in person, and I have not had the chance to talk with Leslie one on one in this way. After chatting about such varied subjects as my education-slash-future plans, the Philadelphia art scene, and the deliciousness of the pastries on Ray’s countertops, I whip out my cell phone and begin asking my questions. Friedman is direct and forthcoming when she speaks, animating her discourse with gestures and excitement in her voice. Her openness and self-assuredness and her enthusiasm for her practice make me glad I made the trek out to the city on this cold, bright day. When describing her show, Go Home, Friedman grows particularly thoughtful. Her words and intentions for this exhibition are informed not only by her artistic background but also by her studies in politics as an undergraduate. The idea for Go Home came about when Friedman heard of a close friend’s 21-year struggle to obtain citizenship in the United Kingdom. Thus, the multitude of papers on display at NAPOLEON (with the friend’s name carefully redacted for privacy) provides keen thematic insight about universal feelings of displacement and otherness. As Leslie goes into more detail about Go Home, I’m drawn in more and more, and I know immediately that answering Friedman’s email inviting me to write this essay was the right choice. wallpaper pasted digital laser prints, site specific dimension, 2015-16. 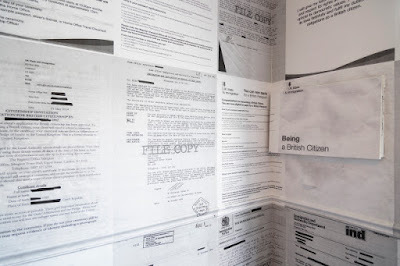 Friedman cites Jenny Holzer’s series of “Redaction Paintings” as a reference for this part of Go Home, if not specifically an inspiration for the show. In this particular project, begun in 2004, Holzer created paintings of heavily redacted government documents concerning the war on terror, and the United States’ subsequent involvement in Iraq and Afghanistan. Holzer obtained the original documents through the Freedom of Information Act. While the idea of FOIA is to create a sense of accountability, honesty, and transparency from the government to the people of the United States, the degree to which the documents were redacted contradicts this ideal of government transparency. In the texts on which Holzer’s work is based, the redacted names remove any trace of identity or humanity from the people described, be they politicians who helped plan war strategies or Guantánamo Bay detainees. Yet Friedman’s choice to redact the name of the friend whose documents, and thus whose life, is on display in her NAPOLEON show creates an entirely different statement. Via redaction, Friedman has succeeded in connecting this particular individual’s experience to all of the people trying to find a safe, stable home in a new country today, be they refugees from Syria or workers from Mexico. When I see the multitude of documents on display, with their dizzying, endless lines of text, I can’t help but imagine what I would do in the place of the unnamed subject to whom these papers belong. What does it mean to not have a home? For your idea of home to be transitory and impermanent? To have to provide hard evidence of your longing for a home on a repeated, regular basis, when so many others can take having a home—this home—for granted? That explains the documents on display in Go Home, I think to myself. But what about the bras? Ah yes, the bras. 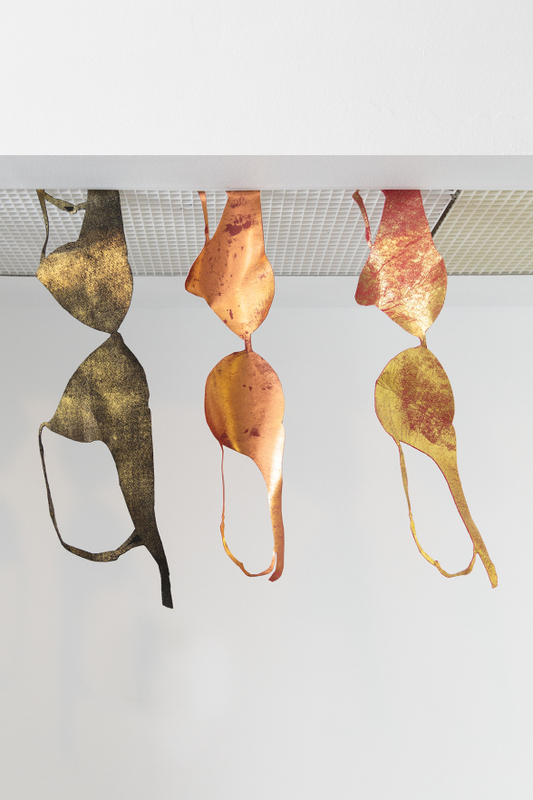 The bronzed bras strung along a line. How do they fit into a narrative about home and displacement and acceptance? Friedman’s answer is simple: the bras reference her friend’s bras hanging above the bathtub in her boyfriend’s house, where her friend is currently staying. Bras drying on a line—instead of tucked away into a drawer, neatly folded—as if she has not yet made herself at home in this country she so wants to be a part of. And this, to my mind, is such a perfect representation; bras are so personal, worn next to the skin and hidden beneath layers of clothing, and seeing them in this transitory, unsure context is genuinely poignant and revealing. Mixed media: felt, faux leather, foil stamp, 20” x 30”, 2015-16. While Friedman’s practice is not specifically predicated on issues of otherness, she is interested in what it means to be an outsider in a multitude of ways. Her 2011 MFA show, Glitzianers, dealt with the ever-topical idea of cultural appropriation in a Jewish context. What would it be like if mainstream culture and fashion were to decide that the physical trappings of Jewish tradition and ritual were suddenly considered cute and cutting-edge? What if, much like how the bindi and the Native American feather headdress have been appropriated by white teenagers and young adults at music festivals, these same teenagers were to don tefilin at Coachella, grow out peyes for Burning Man, and wrap themselves in tallitot for casual, hip, everyday wear? What does it mean for the symbols of someone’s outsider status to be accepted as trendy and desirable while the people to whom this culture truly belongs are still on the margins of society? Visitors to the exhibition were encouraged to take home Lily Pulitzer-esque patterned yarmulkes and think about the practice of cultural appropriation—to consider how jarring and inappropriate taking sacred symbols out of context can be when viewed through the right lens. Similarly, in a 2014 show at NAPOLEON, titled Gay, Jewish, or Both, Friedman collaborated with designer Bernardo Margulis to explore the idea of occupying two marginalized identities in the context of a dinner party. When parts of one’s identity come into conflict, must one choose a side? What does it mean for these sides to play off one another in a cultural and physical way? What do gayness and being Jewish have in common when viewed from an outside point of view? And how does being an outsider in this context differ from being an outsider in other ways? After my transitory time with Friedman, I walk away with a renewed appreciation for the kind of art that Friedman has devoted herself to—the kind of art that asks tough questions about societal issues and ultimately helps us, the audience, understand something new about the people in our world—the people we know well and those whom we cannot possibly know.